Remember porcupine balls? A blast from the past, they were made with ground beef and the help of a particular brand of canned soup sporting a famous red & white label. 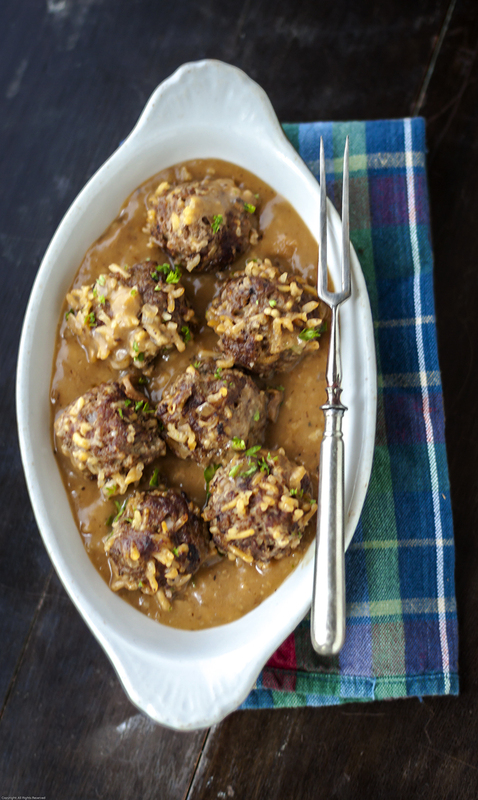 Do a quick internet search and you’ll find plenty of recipes that call this dish “Porcupine Meatballs,” but we called them “Porcupine Balls” when we were kids. Not only did the name make us giggle, but they were fun to eat and, best of all, they tasted great! 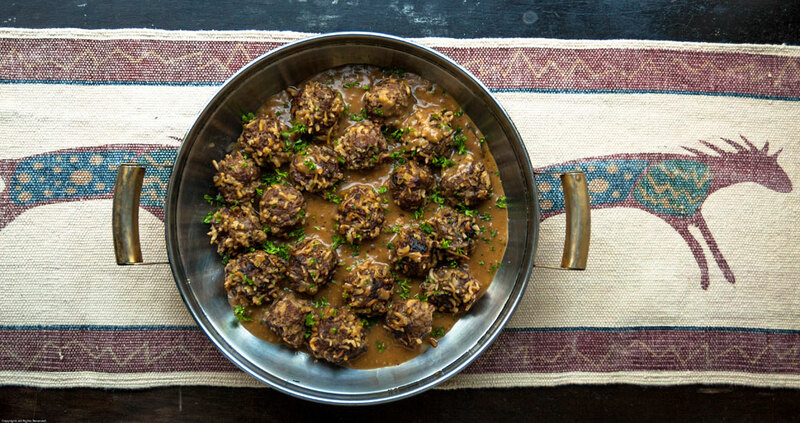 These savory meatballs are stuffed with rice and bits of pasta, which poke out of the meatballs, presumably making them look like little porcupines (hence their name). The little meatballs are simmered to perfection in a rich wild mushroom gravy that is light years away from the kind made with canned soup. We loved this dish when we were kids, but now that we’re adults, we can still enjoy a slightly more sophisticated version, made with healthy, lean and flavorful ground bison and dried wild mushrooms. Too grownup for the kids? Just try keeping them away. Most versions of this dish are made with rice alone, but we also included bits of thin pasta for both their interesting texture and visual appeal. You can make it with all rice or all pasta with equally good results. We also added powdered dried mushrooms to the meatball mixture, adding an additional layer of intensity to the rich mushroom flavor that permeates the dish. Since the meatballs already contain a rice-and-pasta blend, all you need is a salad or vegetable on the side to complete this easy meal. Soak the dried mushrooms in 1-1/2 cups of very hot water for 15 – 20 minutes, or until very soft and pliable. Drain the mushrooms, reserving the soaking liquid. Rinse the strained mushrooms under cool running water to remove any remaining traces of dirt or grit. Drain well, squeezing out excess liquid, then chop coarsely and set aside. Carefully pour off 1 cup of the mushroom soaking liquid, leaving any sediment behind, or strain through a coffee filter. Heat the butter in a saucepan over low heat until melted. Add the chopped onion and cook until soft and translucent, about 5 minutes. Stir in the flour. Continue to cook over low heat, stirring constantly, until the flour is golden brown. Remove from the heat and stir in the beef stock, 1 cup reserved mushroom liquid, chopped reconstituted mushrooms and tomato paste. Return to heat and bring to a boil, stirring constantly. Boil while stirring for a minute or two. Remove from the heat and stir in salt and pepper to taste. 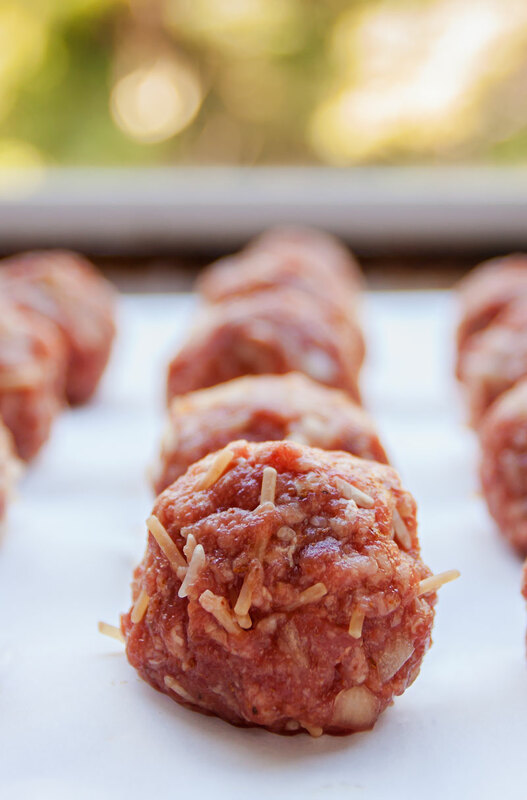 Set aside while you make the meatballs. Combine the first six ingredients in a bowl. Add the ground bison and mix gently, but thoroughly. 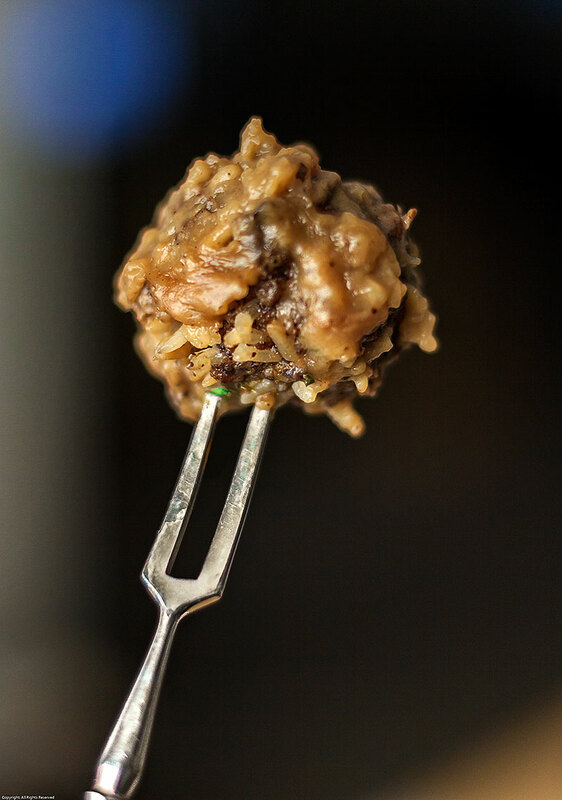 Using your hands or a small portioning scoop, shape the bison mixture into small, firmly packed balls, approximately 1-1/2-inches in diameter. Heat the olive oil a large skillet over medium-high heat. Brown the meatballs on all sides in the olive oil, cooking them in batches to prevent overcrowding. Remove the browned meatballs from the pan to a plate with a slotted spoon. Repeat until all the meatballs have been browned. Drain any remaining oil from the pan. Return all of the meatballs to the pan and pour the mushroom gravy over the top. Bring to a simmer over medium heat, then reduce to low. Cover tightly and simmer for 1 hour. * Buy dried mushroom powder at Earthy.com or make your own by grinding clean dried mushrooms in a coffee or spice grinder. Toast the mushrooms lightly in a moderate (300 degree) oven for 5 – 10 minutes or until they are very dry and brittle, but not burned. Grind into a fine powder. Store unused portion in a tightly closed container where it will remain good for many months.